Relocating to a new city can be exciting and overwhelming. It can also present a different set of obstacles when you think about buying a West Knoxville home. If you’re like many buyers, you may not have all the time in the world to come explore Knoxville. Before you buy a home in a new city, it’s important to make sure you buy a home in the right area for you. 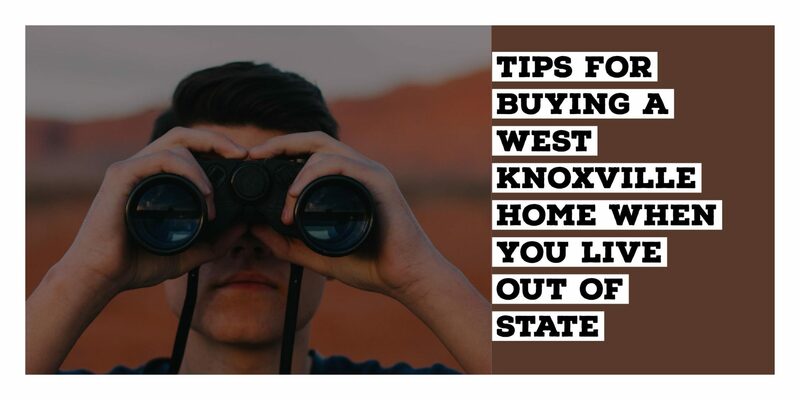 Here are some tips for buying a West Knoxville home when you live out of state. A local real estate expert can make all the difference when you think about buying a home in a new state. Every realtor has a specific area that they specialize in. They know the ins and outs of the area and can provide a wealth of information on the area. When you hire the right agent, they can be a great resource. They can tell you about the area and answer any questions or concerns that you may have. When you’re thinking about buying a home in a new area, you want someone who is a local expert. When you’re buying a home and you live out of state, that still doesn’t mean that you can’t view homes or get to know the area a bit better. With the help of technology, you can see a home even when you’re not physically there. With the help of FaceTime or Skype, a realtor can help you view a home, without even being there. You can get a real-time viewing of a home, even when you’re miles away. In addition, a realtor can always take you video or pictures of a home to help supplement. When you’re unable to see things in person, technology is the next best thing. This can be an essential part of finding a home when you’re not able to constantly be in town. At the very least, when you’re buying a West Knoxville home when you live out of state, try and at least make one trip. A long weekend will allow you to see a few homes and also familiarize yourself with the different areas of Knoxville. Getting a real feel for the area is much different than just reading online. Even if you do hours of research, nothing can replace actually visiting a place yourself. This is particularly helpful when you’re trying to determine where exactly you want to be located. You’ll be able to physically drive the distance between different locations. Finally, depending on where you’re coming from, things could be a bit different. Prior to moving to the state and searching for a home, it can be helpful to learn what differences there may be, particularly the differences in a real estate transaction. These are just a few of the things that can vary by state. So, when you think about buying a West Knoxville home when you live out of state, be sure you find out some of the major differences. That way you’re prepared if things are a bit different. In addition, you may also find out that there are differences with just living in the state. Tennessee has no state income tax, but has a higher sales tax. You’ll get a bigger paycheck, but when you buy groceries you’ll pay more sales tax. Knoxville also enjoys a lower cost of living. You’ll find that you’re able to afford a lot more house when you move to Knoxville. Knowing these differences before you start your home search can be helpful.